Connect a Mini DisplayPort source (Mac, Toshiba laptop, HP notebook) to a VGA display up to 6 feet away. 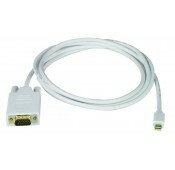 Male Mini DisplayPort to male 15-pin HD cable. Ideal for connecting a Mac (MacBook/MacBook Air/MacBook Pro/iMac/Mac mini/Mac Pro/Xserve), Toshiba laptop (Satellite Pro S500, Tecra M11/A11/S11), or HP notebook (Envy 14/17) to a VGA display.